Three tech companies seem to come up over and over again. They’ve become the trinity of tech, at least as far as most IT consumers are concerned. They are Microsoft, its long-time rival Apple, and Google. Both Apple and Microsoft are veterans, having started their operations in the 1970s and gone public in the 1980s. In IT, that’s a very long time ago. Just think about it, these two companies were part of the birth of personal computing! We thought it would be interesting to see how their fortunes (as in “business success”) have changed through the years, and how Google, a much later arrival, compares. We didn’t look at stock prices or anything that has a measure of speculation to it. No, we looked at cold, hard numbers: Revenue and Profit. To get a feel for the momentum of history we collected numbers as far back as we could. The charts we’ve made for you go all the way back into the 1980s. First let’s look at revenue, how much money these three companies have been pulling in through the years. When you look at these charts, keep in mind that these numbers are all per year, not accumulated over time. Then of course you have Google’s late but big-impact arrival (seen from its IPO in 2004). Google is a success that’s been pretty hard to miss, and here you can see the effect of that. Now let’s look at the profits, which paint a different picture. 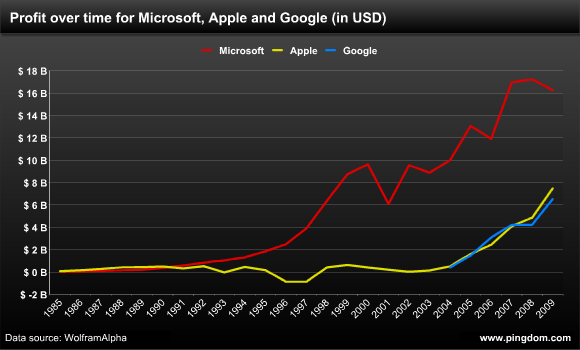 In terms of profit Apple was ahead of Microsoft in the 1980s, but was then passed and left behind. This chart actually reveals that Apple’s upswing the last few years is the first time the company’s profits have really taken off in a big way. Another interesting observation is how closely the profits of Apple and Google match, even though Apple’s revenues are significantly higher. That’s impressive. Google, a company barely a decade old, is matching the profit of a company that not only has been around for a long time, but is now on a serious roll. Now let’s examine each company a bit closer. Say what you will about Microsoft, but they know how to make money, and lots of it. The company that made Bill Gates the richest man in the world has managed to stay profitable every single year since 1985 (which is when they went public and our numbers start). You can clearly see how Apple stumbled in the 1990s. 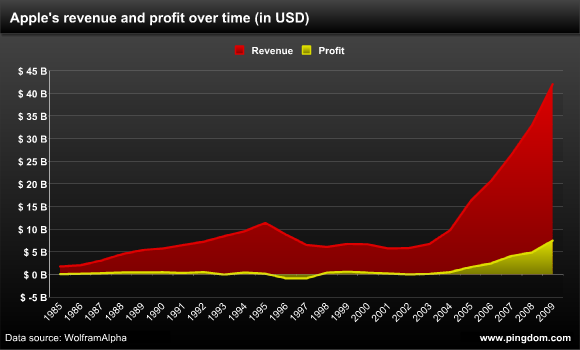 The company was growing its revenue up until 1995, but profits didn’t really keep up and revenue started plummeting. Apple even started losing money for a while. It’s no wonder Apple was desperate to get Steve Jobs back in 1997. Their revenues were going down, they were losing hundreds of millions of dollars. Apple needed to be saved. And now in retrospect we can see that after a few rough years, he did just that. Once Apple had gone through the initial fiddling with everything from introducing Mac OS X, switching to the Intel platform, and introducing the iPod, both revenue and profits started to soar. Apple is way bigger and way more successful now than the company has ever been. Google’s graph shows how steadily the company has been growing. It’s been a model of profitability. Revenue has been rising rapidly, and so has profit. The remarkable part is what we commented on earlier in this article, that Google is keeping up with Apple’s recent success and matching that company’s profits year by year. How much of the revenue is profit? Google and Microsoft are really close here, at just under 28%. Apple with its 17.8% lags behind, but it’s getting better. 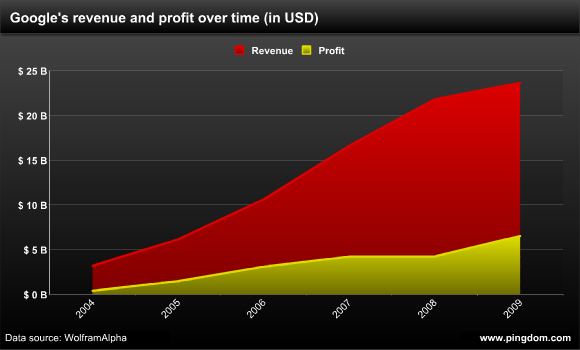 Go back just five years (to 2004) and Apple’s profit was just 5.2% of its revenue. Microsoft is quite impressive in that through all the years it’s never gone below 20%. 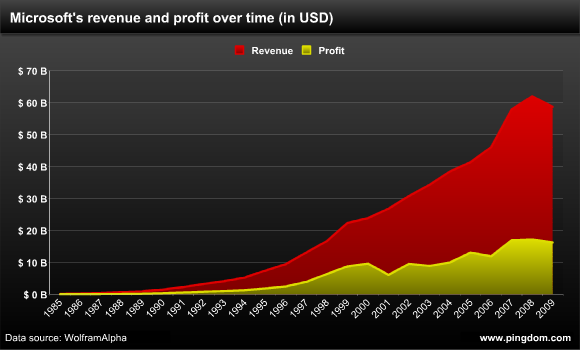 Ok, one exception: in 1985, Microsoft’s profit was “only” 18.8% of the revenue. On the other hand, it’s also gone as high as 40.4% (in 2000). These days we are so used of thinking of Apple as the David to Microsoft’s Goliath, so it’s interesting to look back at a time when the situation was actually the opposite. Microsoft was a much smaller company than Apple back in the 1980s, and it wasn’t really until after its success with Windows 3.1 and Windows 95 that the company really (really) started to approach its current Goliath status. And consider this: Both Apple and Google have been growing their revenues and profits at a much faster rate than Microsoft the last few years. Is that a sign of things to come? Will Apple once more be a bigger company than Microsoft at some point in the future? Will Google? And thank you WolframAlpha for making the data collection relatively painless. Fantastic article. I’ve been really interested in seeing how profits add up, since people are still throwing around the same numbers that they were 4 years ago when comparing Msoft and Apple. Now I wonder what they are doing with all of that profit to improve our lives. It would be interesting to know the total amount of money harvested from the world during each of these company’s lifetimes. Just a heads up, maybe it would be valuable to compare Apple and Dell – given that they’re far more closely related. Google and Microsoft are software companies, but Apple is a hardware company that uses software to extend its hardware. Apple’s significantly lower profit margin is totally understandable. While it would be nice for large companies to be philanthropic, there is no mandate for them to be. In other words, there’s no legal requirement for any company to do anything specific with its profit, just as there’s no legal requirement for you to do anything specific with your profit (the amount of money you have left over after each paycheck when you’ve payed all your bills and obligations, money that you use to go see movies, buy books that you read for fun, or spend on video games). Is it better for us to be more generous with our time and money? Certainly; small amounts of money from the pockets of citizens in developed nations make an enormous impact on the lives of citizens in developing nations, helping provide food, clothing, access to safe water, or medicines for diseases that have been cured here. Bill and Melinda Gates seem to be making efforts to do just that through their Foundation. I can’t speak for their success, nor what steps Google or Apple have taken. I just point out that none of them are legally required to give, just as you are not. Quite, @josh. These are hardly useful comparisons to make. It just shows how misleading numbers can be when in the wrong hands. We can see that in the mid 90 Apple Starts going down, while Microsoft is going up… That’s the Windows 95 effect…. Which wildly different companies in 3 wildly different markets will you compare next? I vote for Nike, Budweiser and GE. This is a fun game! Are these dollar amounts normalized to 2009 dollars? If not, then infalation is not being taken into account and the curves in these graphs are distorted. Nike doesnt produce beer, Budweiser doesnt produce shoes, and GE does neither. However, Microsoft sells software (Windows), hardware (Xbox, Zune), and search (Bing), as well as other web based products. Apple sells hardware (Macs/ipods), software (OSX, App Store), but doesnt do search. Google does Search (google) and software (Android) and a few other things (mostly advertisements). All three have things in common, and overlap. Even though they might not all have the same focus; in fact, all three have separate ‘main’ focuses, they are all competitors in one market or another. To say comparing them is as crazy as comparing GE, Nike, and Budweiser is completely ignorant of you. In fact, it’s not really fair to compare the three to anyone else at all. Dell might be a hardware company which is ‘more’ in line with Apple, but Dell doesn’t sell software, so thats unfair. Because Apple isn’t just hardware, it’s the combination of hardware and software that is the driving force of it’s sales. Apple, Microsoft, and Google are 3 companies that are comparable because all three of them are diversified, dealing in more than one market. And their markets all overlap. Not to mention Google couldn’t do business if it wasn’t for the popularity of home PCs; a popularity caused by Windows and the various Apple OSes. Add RIM and Nokia to this and cover it from a mobile company perspective. These are the mobile competitors. Add IBM to cover it from a hardware/software perspective… I think it would show how little Apple really is even though they are high in “marketing mindshare” they don’t make much profit, hence the need to launch the iPad to sell more content at a higher price (I still contend this is the only purpose of the iPad). I would love to see Apple’s marketing budget, I bet it is ridiculously high. They sell their image/brand and do not partner well, at all actually, with hardware and software. That’s why they will lose this battle over time. Yes they partner with apps for the iPhone and iPad, but that’s not making them much profit at all. Very interesting graphs. Would you please add IBM to the picture. I mean, having lived in the seventies and eighties, I know IBM, DEC, Compaq and even Commodore and Atari as big tech-companies. iirc IBM is much bigger both in revenue and number of employees. Whow, that’s some serious money! But, I think Google is the one with the most knowledge. I find it interesting that Apple’s profit ratio is held back by their hardware, yet people still complain that they are paying an “Apple Tax” supposedly meaning that their computers are overpriced. Judging by the figures, it is Microsoft and Google who have the room to trim their prices should they want/need to. Apple Tax still applies. The lower profit margin is explained by the bunch they pay for in marketing – certainly for the idiotic mac vs pc adds. Are these numbers corrected for inflation? Oh how things have changed, an Apple a day is Microsoft’s dismay! 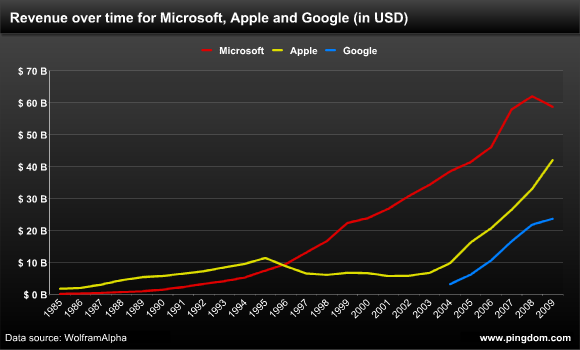 I think Apple has less profit than microsoft and google but is less selfish and greedy than microsoft and google. Apple spends its own profit money to ensure a more quality product to its consumers while microsoft and google focus solely on making the most cash for their greedy concerns.